Yogurt? Don’t you need a machine for that? And, why bother making your own when the stadium-sized supermarket dairy aisle is packed with hundreds of varieties. Greek, plain, fruit-on-the-bottom fruit-on-the-top, low-fat, full-fat, fat-free, yogurt-squeezers, baby yogurt, chocolate-chip yogurt with mix-ins that look like fruit-loop cereal … Surely, there’s something for everyone. Even with all the different brands and flavors, I feel like there are really only two options. There’s the yogurt-disguised-as-dessert in bright plastic cartons painted with white chocolate raspberry delight, or whipped key lime in curling font. I’m confused about sugar labeling these days. Ask me to translate grams to teaspoons at 4 PM on a Friday afternoon with 2 or 3 kids in tow, and my brain might explode. Nonetheless, I’m pretty sure chocolate salted caramel yogurt has a lot of it. At the other end of the spectrum is Punishment Yogurt. Chalk white containers made out of recycled tree bark, containing thick, stand-a-fork-in-it Greek-style yogurt, so sour it makes your gums sing. I have to swirl in 5 tablespoons of maple syrup or fruit jam before my kids will go near it, and then we’re right back in the yogurt-as-dessert territory. What about good, wholesome organic yogurt that sits somewhere in the middle? 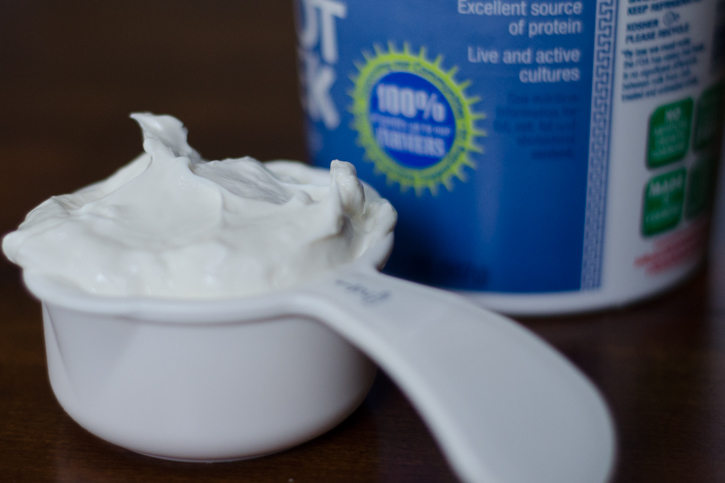 Thinner than Greek, barely pourable yogurt with a recognizable but unobtrusive tang – a little reminder that yes! this is good for you AND yummy. But, I couldn’t go out and buy another kitchen gadget that would end up in the basement next to the seltzer water machine (damn those CO2 cartridges!) and the hard-boiled egg slicer and the plastic butter spreader for corn-on-the-cob. I know myself too well. The pressure to actually use the yogurt maker, to justify it’s precious occupation of shelf space, would mount until I guilted myself out of ever using it. No, this had to be an inexpensive, last-minute, easy process, or I’d never do it again. 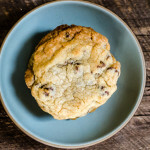 I checked in with The Kitchn, my go-to for DIY food projects, simplified. They insisted this was an easy project and that you don’t need a machine! Only a trusty heavy-bottomed pot, high quality whole milk (or 2% if you prefer) and an oven with a working light. 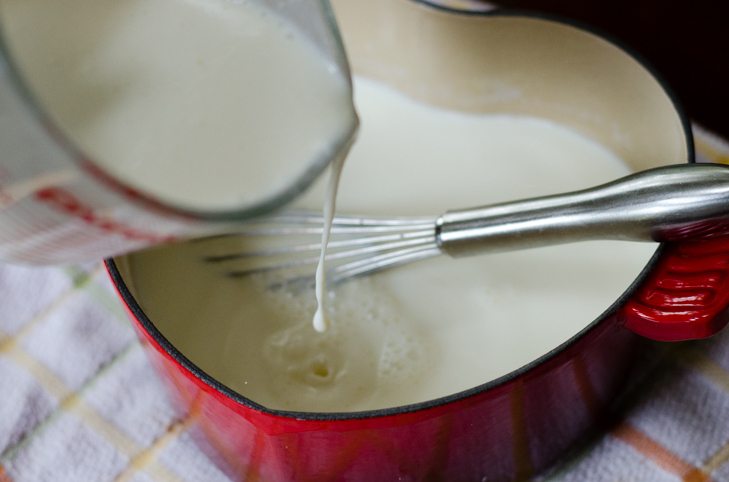 Heat the milk to 200 degrees, let it cool to 115 degrees, whisk in some yogurt starter and let it sit in a warm dark place for 4 to 8 hours, until it has morphed into a tangy, pourable, rich, delicious yogurt. Practically foolproof. 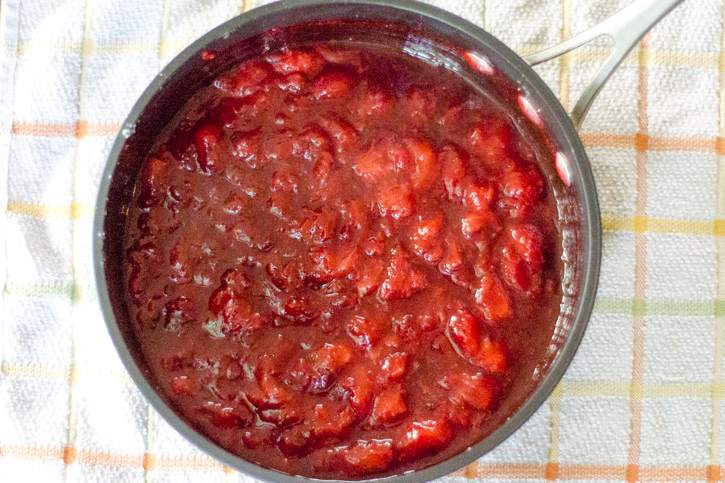 The technique was so easy that I added a recipe for fruit-forward strawberry compote to go with it. 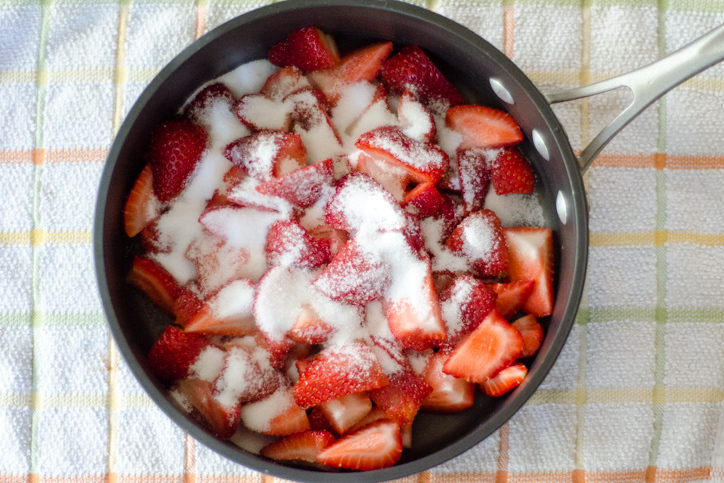 Mix together strawberries + sugar + lemon juice and zest, simmer for 15 minutes, mash it with a fork, done. Dollop a spoonful in the bottom of your bowl, pour yogurt on top, and there it is, *fruit on the bottom* yogurt. The recipe is colorful, fruity, with minimal sugar, and adaptable to other berries, skinned peaches, or cherries. And if you need any more reasons, making your own yogurt + mix-ins is actually cheaper in the long run, and declutters your recycling bin. Yogurt dilemma solved. I started making yogurt a few weeks ago because I wanted an alternative to the baby yogurt on the market. But then, we all fell in love with it. The baby doesn't have anything to compare it to, so it was an instant hit with her. The big kids love to eat it plain, swirled with strawberry compote or with a drizzle of maple syrup (easier to mix-in than honey), in smoothies, or in pancake batter. For dinner, we dress it with a squeeze of lemon juice, a sprinkle of salt, and some chopped cucumber and dollop it over lamb or fish. We prefer to use whole milk but 2% works great too. The important part is to use high-quality milk. Any organic supermarket brand will work. 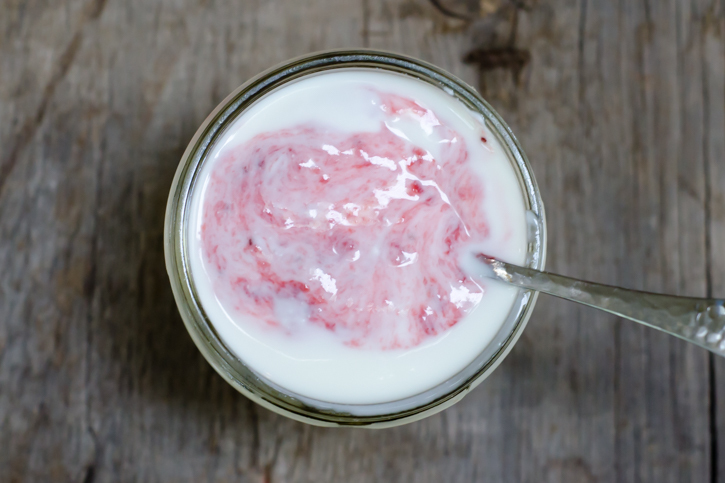 In terms of a yogurt starter, you can use a mail-order organic starter or just use a half cup of your favorite plain yogurt. *The caveat: The yogurt must have the words *live and active cultures* somewhere on the label, or it's useless for this purpose. The longer you let the yogurt set up, the stiffer it becomes. I like to heat the milk before bed and let it sit overnight, wrapped in towels (for insulation, so the temperature hovers around 115 degrees all night) in an oven that's turned off, with the oven light on. 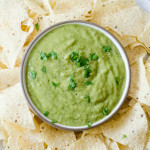 In the morning, pour it into containers and refrigerate for up to a few weeks. 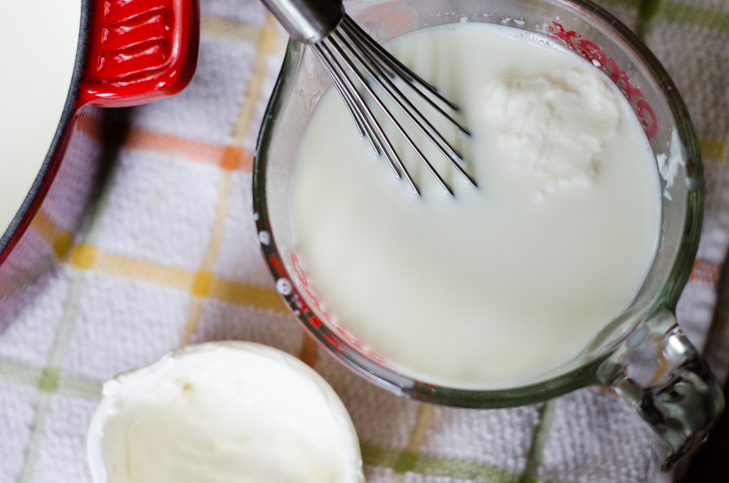 For a thicker, Greek-style yogurt, try straining it through cheesecloth after it sets. 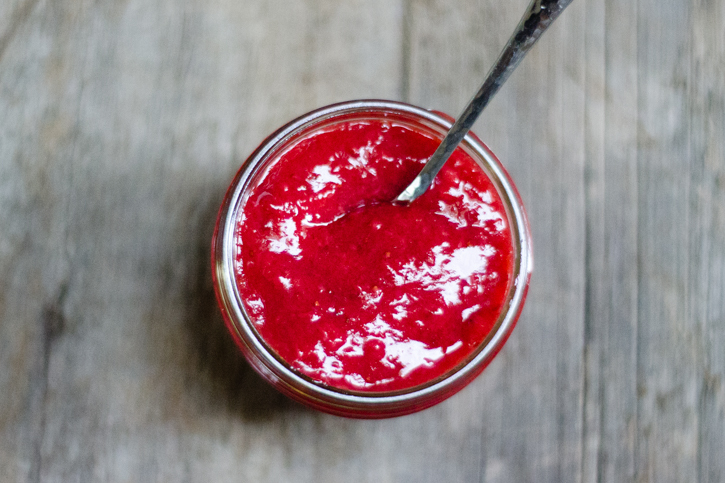 The compote is my (less sugary and weird) version of *fruit on the bottom*. 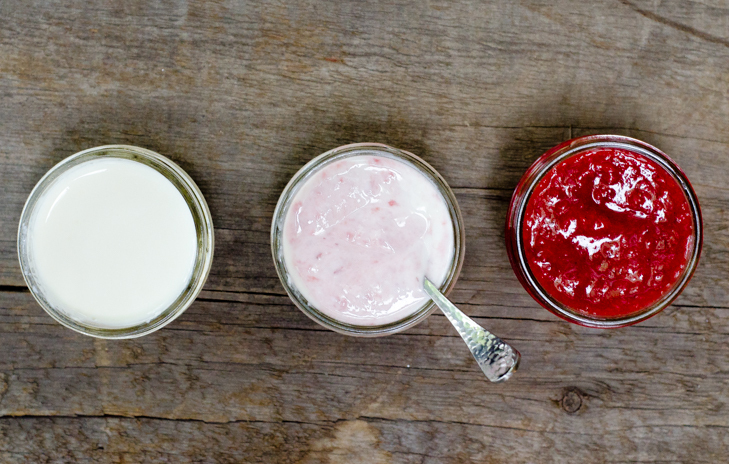 Swirl it into your yogurt or spread it on toast. It will last in the refrigerator for about a week. The compote yields about a cup and yogurt makes about 2 quarts. 1/2 cup plain whole (or 2%) yogurt *label must read "live and active cultures"
In a two to three quart oven-safe, heavy-bottomed pan or Dutch oven over medium heat, heat the milk to 200 degrees. 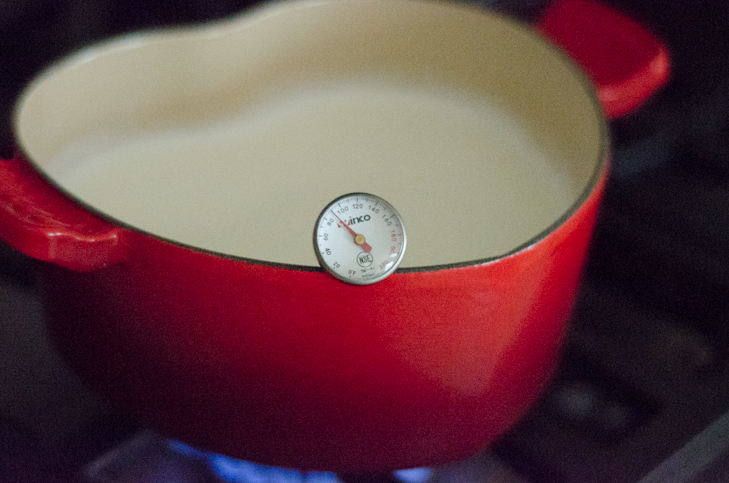 (If it's slightly below, that's ok, but don't let it go above 200 degrees because you don't want it to boil). Use a candy or meat thermometer to keep track of the temperature. Remove from the heat and, stirring occasionally to break up the skin that will form on top, let the temperature fall back down to 115 degrees. This should take anywhere from 10 to 15 minutes, depending on time of year and temperature of your kitchen. If you're in a rush, you can also plunge the pot into a bowl filled with ice water, stirring constantly to quickly lower the temperature. 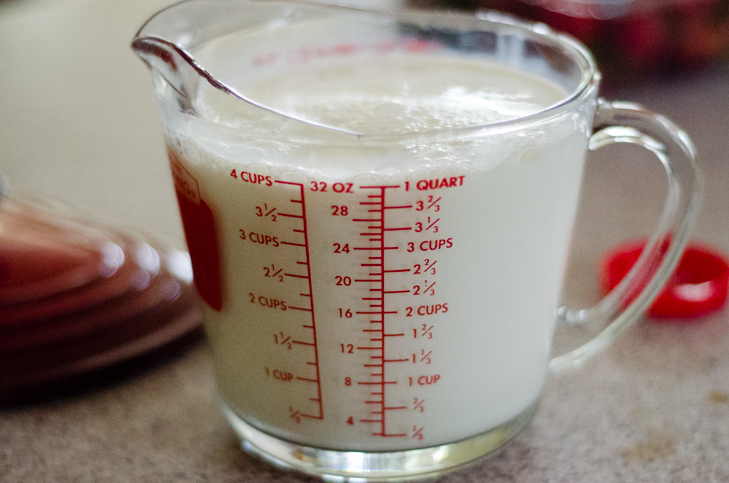 When the milk reaches the desired temperature, scoop out a cup and pour it into a small bowl. Add 1/2 cup of yogurt and whisk to combine. Pour the milk/yogurt combination back into the pot and whisk lightly to combine. Cover the pot and wrap in towels for added insulation. Place it in the middle rack of your oven. Leave the oven off, but turn on the oven light - this will give off just the right amount of heat to keep the temperature of the yogurt stable. *If it's mid-winter and your oven is ice cold, try heating it on the *warm* setting for a few minutes before turning it off and adding the pot. Let it sit, undisturbed, from four hours to overnight. 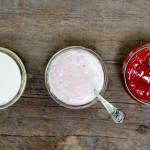 When it reaches the desired firmness, pour the yogurt into tightly-lidded containers and refrigerate for up to two or three weeks. Combine all of the ingredients in a small, non-reactive pot over low heat. Cook, stirring occasionally, until the fruit has softened, broken down, and has reduced to a chunky, thin syrup that coats the back of a spoon, about 15 to 20 minutes. Remove from the heat and let cool. 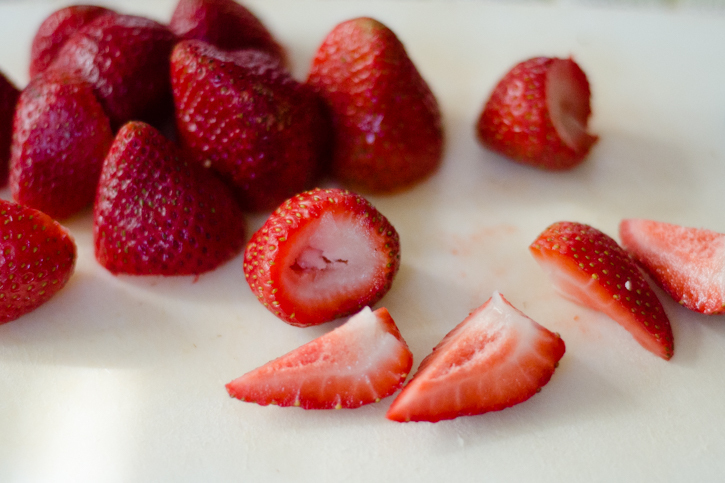 Feel free to leave it chunky, smoosh the fruit a bit with a fork, or blend for a smooth syrup. Refrigerate for up to a week. I had one of those “cute little yogurt makers” way back when! It was “lost” in one of our many moves after having been relegated to the only space available-out of reach and out of sight and soon forgotten. I can’t wait to try your recipe as I find most Greek yogurt in the Supermarket to be acidic and the rest too sweet, too many additives, etc. to say nothing of the time spent reading labels and trying to make a choice among the myriad brands. I use pretty much the same process you do, oven light and all. Only I use two (sometimes three) quart canning jars, set them on a dishcloth inside a deep pot and fill the pot with water around them. When the milk in the jars has reached the correct temp, just remove the jars to a towel on the counter to cool down. Put straight into the oven, then straight into the fridge when finished!